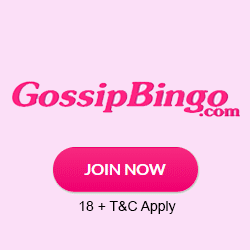 Gossip Bingo Review | You Have a £10 Bonus + 20 Spins Here! News hot off the press is that Gossip Bingo have had a bit of a makeover and they are looking better than ever. You can see straight away that the site is sleekly designed, and it couldn’t be easier to make your way around it. It is part of Netboost who are responsible for other sites that are similar in style and promotions such as Moon Bingo, Cupcake Bingo, Robin Hood Bingo and others. As soon as you register with Gossip Bingo they will give you 3 days worth of free bingo in the Biggie Room – no deposit required. When you do make your first deposit of £10, they will also give you a fab 100% bingo bonus, which means a £10 deposit will give you a total of £20 to play. As well as the bonus cash you’ll also receive 20 spins to use on the Irish Luck slot game. Play the Power Penny jackpot game for £250 daily. Check out the Super Millionaire jackpot where you could win £1 million. There are free bingo sessions every single day. Look at Sure Win games, where every single person will win a prize. Head over to Penny Bonanza where you could win £5,000 for a penny. Enjoy chat games where you can earn extra loyalty points. Although they don’t have much in the way of promo codes featured on the site itself, make sure you keep your eyes peeled for some special codes that would be sent via email. It’s worth following Gossip on social media channels such as Facebook and Twitter. They run a number of competitions to win free bingo tickets and dish out exclusive promotion codes from time to time. Gossip Bingo does have a dedicated mobile app that you can download from your iOS and Android smartphones, however, you can also access the site simply by entering in www.GossipBingo.com into your mobile or tablet browser. Once you do this you can simply sign in or login to your existing account and access everything. If you are new to the site, all you need to do is fill in a registration form and you will be a member within minutes. Bingo can be enjoyed 24/7 at Gossip Bingo which means there is always lots of fun to be had. There are 3 different variations which include 75 ball bingo (also known as American bingo), 90 ball bingo (where there are 1 line, 2 lines and full house prizes) and Swedish Bingo where there are 5 chances for you to win. When it comes to slot games, you won’t go wanting for those either. When you click on the slots tab or head to the games lobby you will find the likes of Rainbow Riches, Raging Rhino Slots, Fluffy Favourites, Enchanted Prince, Tornado Farm Escape, Mermaid’s Pearl, Secret Garden II, Jack and the Beanstalk as well as many others. A handful of casino games are also available if you feel like having a go on those too. An incredibly generous welcome offer. Free bingo sessions for bargain hunters. The majority of the promotions are networked. It can be difficult to find all of the terms and conditions for wagering requirements. At Gossip Bingo you can deposit using the following methods: PayPal, Paysafecard, Neteller, MasterCard, Entropay, Maestro and Visa. Wagering requirements are 4x on bingo, 85x on slots. The minimum withdrawal is £5. Processing can take 4-7 days. New players, min dep £10 for 200% Free spin up to 60 spins + 100% Bingo Bonus up to £30. Bingo bonus WR: 4x (deposit+bonus). Each spin capped at £0.25 which can be played exclusively on irish luck, WR: 85x(bonus). Games Bonus wins cap: £400 + the initial bonus amount. UK only – your deposit balance is available for withdrawal at any time. Withdrawal restrictions & full T&C’s apply. There are definitely a lot of benefits to Gossip Bingo. The welcome offer is a real crowd pleaser and they do have a lot of promotions and games to take advantage of. They could host more promotions that aren’t part of the network to make them stand out a little more.